The World Muay Thai Council (WMC) USA is moving quick since the last WMC USA show. They are staging and sanctioning pretty quickly near back to back events. Apparently the main event on August 14th, 2010 is a World Championship fight for a bona fide WMC world title. Thailand’s own Lom-Esan “The Destroyer” vs. Numpon “The Tornado” are due to battle for the WMC World Welterweight Title Belt though last I checked that title wasn’t vacated willingly or unwillingly. This would mark the first time a WMC world title was matched in the United States albeit with no Americans in contention. I am somewhat surprised that this card has gotten basically no promotion of any kind. And I would honestly be shocked if the entire card does come together as announced with as much Thai talent as there is on this card and the accompanying difficulties inherent in securing visas for all of them. The purses for these titles has to be at a premium as well. Interestingly enough there is supposed to be a concert that will also be a part of the entire promotion featuring hed Pe and another band. Looks like this show is trying to secure the guys who forgot 90’s nu metal was over as part of the audience as well. 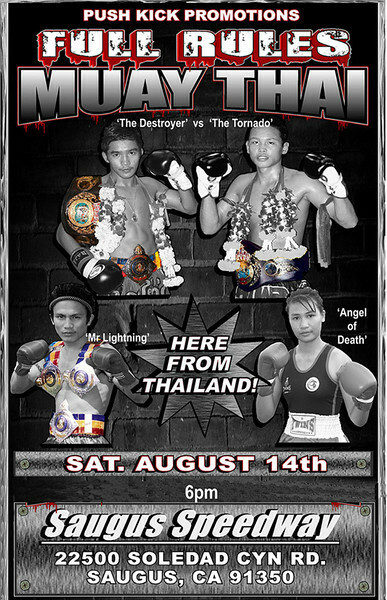 All kidding aside, the Thais on the card are pretty current and very talented on this event. If all goes well it will be an incredible event with a level of Muay Thai most Americans never get to see in person. But between the concert (complete with headliner and opening band) and the big Thai names on there can it be done with the promoters and sponsors not bleeding money out? For more information here is the link to the Push Kick Promotions site. And sincerely, best of luck to Push Kick in trying to bring this card to all of us. ~ by fatsoking on July 27, 2010. My first thought was to post WOUV but then I read that it’s WMC and another title robbery ’cause that’s what the WMC title fights are these days. Well this would mark a first that it happened in the United States if this card comes together.